I love this cat Didga! Question… I found tutorial one but are there more and where might I find them? Should I send email to separate email address? Here is my issue. 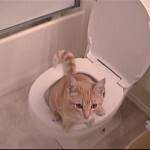 We are training two cat to use the toilet. It had been going fairly well, although poop ends up outside the toilet. ( Stage they were in: 2-3 weeks with kitty litter in a lasgne-type tray ( similar to the bowl method you suggest ). That is one problem. But now both cats are pooping and peeing elsewhere around the house. I think I know the answer, but should we go back to kitty litter in bit litter box on the floor? ( Yes?). Also should we isolate them in the one area of the house – we can in a small hallway and the bathroom.. until they start using the bathroom (either back to a kitty litter box, or keep the pan/litter in the toilet). Go back to the stage they were doing perfect and you have to move along at the pace of the cat that is not grasping the process as quickly, REALLY watch the video and follow the advice as prescribed, use the things that I use (or as close as possible). sometimes isolating or restricting area is a good idea. Also I’m going to update this post and let everyone know, I’m only answering questions that are asked through my CATMANTOO APP search your APP store, use the “your wall” tab to ask your question. HI, there are links to some of the other tutorials located int he description areas of each video. Also I’m going to update this post and let everyone know, I’m only answering questions that are asked through my CATMANTOO APP search your APP store, use the “your wall” tab to ask your question.